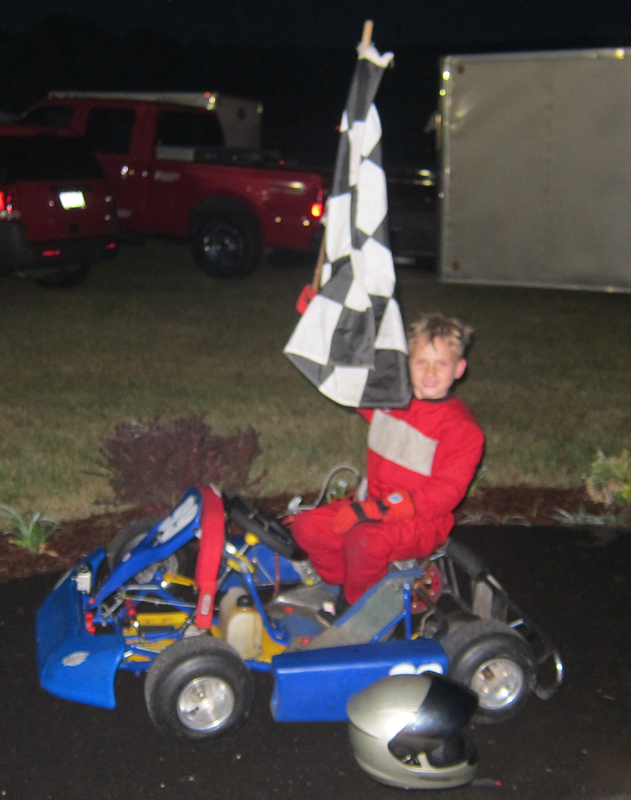 Father’s Day weekend was the first night race of the RAKC. Jason was, of course, excited to be racing again, never mind that it was a night race! We arrived somewhat early after picking up some oil at Faster Motors, as there was none to be found anywhere in our stock. Even the motor was dry. The pits were also a bit crowded because we needed to jam everyone into the parking area next to the track due to lots of June Sprint campers. That’s right, we had to watch auto racing between the go kart sessions. Practice was expected to start at 4:30, but they decided that since there was already a bunch of folks there, practice would start at 3:30 and they would add an extra session. After rushing to the track, we managed to get some laps on an empty track for the first practice session. No lap times were recorded, since the beacon was not set up yet. We missed the second practice session because of the noise of the race cars and a lack of schedule, and our own negligence. Easton had the track to himself. The third practice session was canceled due to rain. Boy did it rain. It rained pretty hard for about 30 to 40 minutes. Brandon and I grabbed Easton’s kart and tossed it into his trailer. We then jammed Jason’s kart into the back of the truck, running over a bunch of things and nicely wedging it in. There were several challenges during the race delay, including but not limited to: keeping two bouncy kids from getting their racing suits and shoes soaked, not getting too wet ourselves, preventing the awning from blowing away, and avoiding getting hit by lighting. Once I rearranged things in the truck, the boys were able to sit on the tool boxes in the back and stay dry. It was raining hard enough that there was a small river running from the road directly through our shelter and under the truck, and the wind filled the chairs with rain water off the awning. At the track, I like to wear motorcycle boots with steel toes, which meant my feet stayed dry, Brandon was not so lucky. Once the rain stopped, the big track lent the little track some equipment to dry it off. After the blower truck, brush tractor, and track vacuum did their thing it was still too wet for racing. Because the campground is right next to the track and there are other neighbors, there is no racing after 10pm. So we had to get started by 6:30 or run shortened races. After consulting with the drivers, it was decided to send a bunch of karts out on the track to give it a final dry. 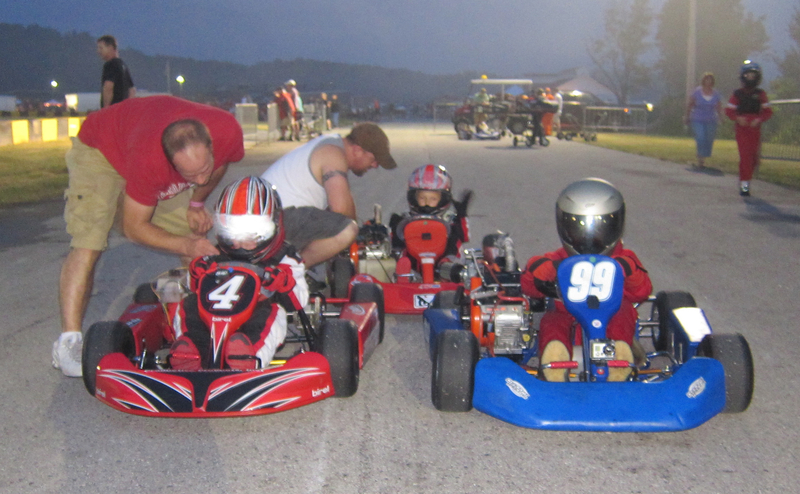 About an hour later, around 7pm, the kids were on the grid and ready to go for a shortened first 4 lap heat. Left the clear visor at home. The other karts where dark spots on a dark track. Jason and his kart really out-classed the other racers. Easton’s kart was having performance issues and the other racer was very new. In both heats Jason passed both of his competitors. He managed to stay clean and lapped at least one of them, and finished just behind the other. For the feature race he pretty much did the same thing. This kind of win is actually not that much fun. Having someone to actually race against makes you feel like you have earned something. Despite the lack of competition he was very excited with his first win and had a great big grin on his face after weigh in as he headed for the winner’s circle. For the race and the heats I stood on the first corner with a yellow flag. This was the one spot that did not get dried by the trucks and karts because it was not part of the big track and only used by the kid karts. Thankfully, it was pretty sloped and had dried nearly completely on its own. Ultimately the kids made through this corner with out any problems. One thing I noted while watching them race, is that Jason is getting off the gas very early and entering the corner very low (close to the inside). If he stays on the gas with that line he will spin out. If he learns to enter the corner higher (closer to the outside) he should be able to maintain more speed through the corner. I suspect that this is where he is losing most of his time. He is just about to break into the 29 second range; last season’s track lap times were in the area of 27 seconds. Next week we will be practicing at CHMS with the hope of racing there in two weeks for their night race.